Wireless devices are everywhere now... from laptops to smartphones, tablets and ebook readers. Even printers and hard drives can be connected to a wifi network. So it's important to get the best possible signal from your wireless router. WiFi is a type of radio signal, so it's simply a matter of eliminating interference and boosting that signal to extend as far as you need it to, and doing it in a way so you'll still get the same amount of power. Position The Router - Yes, where you place your router does matter. If your wireless laptop or tablet is in another room, the signal has to go through walls and other interference before it reaches you. You can change the positioning and give everyone equal access. For example, in an open office room setting, instead of placing the router in a corner, try putting it in the middle of the room, where the signal should extend out more evenly, giving better coverage to the entire office. If you're looking for optimal wireless coverage in various parts of your home, position the router in the middle of the house. Moving it up off the floor, to a bookcase or shelf, should also help. If you only have one wireless computer, and it's always in the same place (ie: your office, the kitchen, or the hammock) then it makes more sense to place the router closer to the computer, rather than in the center of the house. But experiment -- I've heard of cases where there was a very weak signal, and the problem was that the router was TOO close to the computer. Avoid Bad Neighbors - Remember, wifi is a radio signal, so the signals from microwave ovens, cordless phones and even fluorescent lights may cause interference and signal degradation. Other things that can wreak havoc on wireless networks are bluetooth devices, wireless game controllers, your neighbor's wireless router, and powerful WiMAX signals in your area. Even poorly wired electrical connections in a home can interfere with wireless signals due to broad radio-frequency emissions. Steering clear of as many of these problems as possible may provide a boost to your wifi. Extend the Antenna - There are some decent wireless antenna boosters available that you can purchase as addons to your current wifi router to help the signal extend out further. You just plug them directly into the router base (sometimes called the Wireless Access Point, or WAP) and it can give you that boost in the signal that you need. Hawking makes several types of wireless antenna boosters. One of the most powerful indoor models is the Hawking Technologies HAI15SC, which can boost the strength of your wireless signal from the typical 2dBi up to 15dBi! The HAI15SC's hi-gain "corner antenna" replaces the external antenna of your wireless router, significantly improving signal strength, distance, and wireless performance. This unit sells for about $40, and can be found at Amazon and many other online retailers. Repeaters and Range Extenders - This little gizmo just takes in the wireless signal, boosts it up to full strength, and spits it back out again. Place the repeater within range of the router, and near the computer that needs a wireless signal. Linksys, D-Link, and other vendors offer wireless repeaters, also called range extenders. I recently bought a TP-Link N300 range expander (under $30), which is performing well in my home. Typically, installation of these things is very easy. Just plug it into a wall socket, connect it to your wireless router, and you're done. If you have an Apple computer, look into the Airport Express as a signal repeater. Gettin' Geeky - Some DIY geeks have come up with interesting ways to extend or boost your WiFi signal. One example is the Pringle Cantenna method. This may seem like a hoax, but the technique actually appeared in an O'Reilly book titled Building Wireless Community Networks. Another method that works is adding a home-made parabolic wifi extender to your router's antenna. Other techniques, such as the satellite dish using a cell phone are elaborate hoaxes, and I'll admit I fell for this one before a kind reader set me straight. Wired Wifi? - One idea that sounds counter-intuitive is to use the existing wiring in your home to extend a wireless signal. My article One Cool Solution to Weak Wifi Signals discusses how to eliminate wifi dead zones with powerline ethernet. In a nutshell, this technique uses your home's electrical wiring to transmit an Internet signal to another room, where it can be "rebroadcasted" as wifi. Upgrade Your Router - If you've owned the same router for several years, it might be good to go pick up a new one if you want to enhance your wireless network performance. Some of the latest models have a stronger signal. The newer "N routers" generally have a stronger broadcast signal, and they'll work even if you have an older 802.11B or G adapter in your computer. One caveat... if you have a router supplied by your Internet service provider, and you've got a tv/phone/internet bundle, you may have difficulty duplicating all your router settings on a new off-the-shelf router. Using a wireless extender or repeater would be a better idea in such cases. 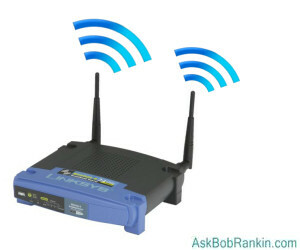 Tweak Your Settings - Your wireless router has special features that you may or may not want. Read the manual that comes with your router (or Google it) and tweak it to fit your needs. Most modern ones are "just plug it in" though there might be ways to boost signals or to make sure it is sending out signals that are optimized for your computer's wireless adapter. For example, most routers are set to broadcast on channel 6, but it's possible there may be less congestion or noise on a different channel. Try switching the channel to 1 or 11 and see if it makes a difference. Is Your Wireless Router Secured? - Make sure your neighbor isn't hogging all the juice from YOUR wireless router, or doing illegal stuff that could get YOU into trouble. Get your network secured so only you are using the signal. Tap into your router's security features and make sure you use secure passwords. See my Wireless Network Security Checklist for help with this. And if you're not convinced about the need to secure your wifi, read about The WiFi Security Mistake You MUST Avoid. Upgrade Your Router Software - Another thing you can do without spending any cash is to make sure your router software is up to date. To do this, visit the website of the maker of your router, whether it is Linksys, D-Link, or some other brand. Check for your model number and make any updates necessary. Another option is to use alternative firmware. While your router's original software (aka firmware) should be all you need, some routers do not output the signal at the maximum possible strength. You might want to check into alternative firmware, like OpenWRT, which promise to boost the wireless signal. But be careful with firmware updates -- if you load the wrong code for your router, you can foul it up with no recourse. I'd recommend this option only for tech-savvy tinkerers. Is a Chromebox Coming Your Way? Most recent comments on "Boost Your WiFi Signal: Ten Tips and Tricks"
If you live in an apartment or condo, an app like "Wifi Analyzer" is a huge help. It will read signal strengths of your system as well as all of your neighbors. This can help optimize the placement and proper channel settings on your router. I have had some experience with #6 Wired WiFi. They can work well, but with two caveats. One is that both ends of the 'extension' must be on the same breaker. The other is pretty much a deal breaker: no surge protectors. They work similarly to the old Radio Shack X10s, in that they introduce a series of small spikes into the electrical stream, which are then interpreted by the box at the other end. A surge protector is designed to, among other things, shave off said spikes. However, if you have a 'Whole-House' type of surge suppression, these will work fine. Just my $.02. Since my router HAS to be located next to my PC upstairs in the den, I had a similar problem that was not to be solved with tweaking as FCC regulates the max (RF) power to be transmitted. Longer antennas or Pringle can type (RF) "range extender" are (as you said) for those of us that are geeks but even then no one has ever been able to squeeze blood from a (...errr) tomato! My answer was the purchase of the NetGear AC Powerline (not via long runs of network cables) networking hardware. Specifically, the NetGear Powerline500 WiFi Access Point (XWNB5201) adapter that simply plugs in to the wall outlet. This configuration precludes having to run network cables inside the walls between the 2 reas, as well! The trick is to give this new WiFi network the same exact name (and password) as the original router. I have full coverage all over the house both upstairs as well as downstairs. What makes this unit even more price-worthy is the fact that by adding an additional network switch (rather than a network router) downstairs, I am now able to also connect my smartTV, my DisnNetwork Hopper DVR and few other networked hardware located downstairs to connect and share the same ISP provided router that is upstairs. This configuration also allows me to stream and connect my upstairs WD MyCloudsEX2 NAS to both my networked audio system (for music files) and my SmartTV/DishNetworkHopper (for movie playing). I apologize for the long rant! But I hope it comes in handy for some as an alternate to the great coverage Bob Rankin has done (as always). For years I've had endless wifi problems, with our DSL modem/router in our garage and computers at opposite ends of the house (with lots of walls in between). I've tried numerous range extenders, but they have a tendency to crap out after a few months or a year. (Sometimes I'll get lucky and it happens just before the warranty runs out. Other times, not.) Then I have to spend hours on the phone with technical support until they finally give up. Also, the modem/routers themselves will die every several years, but at least I've gotten AT&T to replace them at no charge. (And the AT&T service techs have been excellent and very helpful.) When it happened again a few weeks ago, I put a laptop fan under the new modem to keep it cool. I think that's helping. But I finally broke down and ran a 100 foot Ethernet cable from the garage modem through a hole in the wall I drilled; up along the eves; and back through another hole into my office where I installed a TP-LINK wireless router. After spending many more hours getting them to play together, it's finally all working. I have 15.3 Mbps to our several computers at that end of the house (which is the maximum I'm paying for). As long as that keeps up, I'm very happy. But I don't dare touch anything for fear the cobbled-together system will fall apart again. I had an extension built onto the house, so the new rooms were the other side of a solid concrete wall that wifi barely penetrated - not enough for the iPad which has never been good at picking up distant signals. I bought a TP-Link range extender, the plug-into-mains type, which picked up the weak signal and lo! full strength wifi everywhere. Five minutes to read the instructions and follow them through successfully. Thanks, Bob, for your comprehensive and useful article I'll share. Illuminating (pun intended) that health-harming fluorescent lighting interferes even with wifi, and that poor electrical wiring can mess with wifi too. And fascinating that cables can bridge wifi gaps to extend wifi. as a whole... Mr Rankin, Sir. this kinda info hard to get here in south africa. Thank you, and peace to us all. My Internet is connected in my office, where I have my wireless router. My shop is 1500 feet away and its not possible to run a cat cable. I can't put up an outside antenna on my office (due to zoning) but I can on my shop what would you recommend? Bob, I use Ideaworks model: JB6612 antenna. Works great for me @ home and in the RV. (speeds up to 8Mgs cost $37). Pan..I have another cord pluged in the USB port. I got used to it. PS. Thanks for a great site. I think this is a useful article, but this area can be complicated. I recently added my old Linksys WiFi router as a second router when my cable company replaced their modem with a modem+router. This now covers what was a weak/no signal zone at the very back of the house and in the garden. Fortunately, I was able to run an Ethernet cable through the roof to connect the two (eventually). This worked fine, but initially, I followed advice on the web that tells you to use the same SSID on both the routers. The implication is that devices will automagically switch to the router with the stronger signal. This simply isn't the case: most devices (even modern ones) Hang On For Dear Life to the router to which they first connected. In retrospect, this is logical, as you don't want your device constantly scanning for other networks as you walk around your property across zones of weaker signal. So now I have a second SSID on the second router and everything works fine. I can at least bring up the WiFi list and switch SSIDs if I'm at the back of the house or in the garden for any length of time. Ok I am a woman but have a techy son who is out of the country and time warner is coming to install cable for internet only at 30 mbps (I only have 1mbps now with verizon dsl, yuk) Problem being, I bought a good modum rather than renting theirs...I have Sprint, yes I do have an Airwave that they give me for free. Still have dead spots in kitchen and bedroom and outside where I drop calls or there is a delay in speech and people just cant keep up with a call. I have a very small house 30x30 cape cod and don't use the upstairs at all. My town has good sprint reception EXCEPT for the small pocket where I live. My son, out of town has said to wait till he gets home. He gave me two options. Get a really expensive router (more than the one I bought which is the Netgear N750, OR and/or to move the routers and modem into the kitchen, (one room closer to driveway) and get "2" routers and connect them together. Which is a better way to go and if so, which router/routers should I get? They are coming this Friday after thanksgiving (2015) to install the cable, I can reschedule if need be. Please help!!! EDITOR'S NOTE: Sounds like your son has a plan. Why not let him try it out? do you still have the ext storage for sale.